Hollington United have gone nine points clear at the top of the Macron East Sussex Football League Premier Division. The leaders made it 14 wins from 16 league games with a 2-0 victory at home to Rock-a-Nore on Saturday. Goals from Sean Ray and Ben Phipps extended Hollington’s advantage over second-placed Battle Baptists, who were again in cup action and now have three games in hand. Elsewhere, it was honours even as fourth met third in the top flight. A Gary Hempe penalty gave Sidley United a half time lead away to Sedlescombe Rangers, but Kevin Clifford equalised to earn the hosts a 1-1 draw. Hawkhurst United moved into the top half by beating Ore Athletic 5-2. Thomas McClintock (2), Daniel McGahan (2) and Tyler Charles scored for the Hawks, with Scott Ramsey and Kale Williams responding for Ore.
Crowhurst climbed back up to second in Division One after a hat-trick from Reece Johnson helped them to a 5-2 win at Herstmonceux. Tom Andrew and Jordan Turner completed the scoring for the visitors, who are three points ahead of third-placed Bexhill Town having played four more matches. Having waited until February to record their first league win of the season, Mountfield United made it back-to-back victories with a 4-1 success against Icklesham Casuals. Goals from Ben Waite (2), Leon Pettit and Chris Bates moved bottom-of-the-table Mountfield within three points of second-bottom Icklesham, whose goal was scored by Sean Baker. Division Two leaders Bexhill AAC needed a 35-yard added time wonder strike from Darren Witham to scrape past bottom side Ticehurst 3-2. Prior to that, the goals of Alex Williams and Luke Dangerfield had been cancelled out by Josh Vidler and Leon Fisher for Ticehurst. Westfield III overcame Burwash 4-1 to go second. Billy-Jo Driver, Liam Cobley, Marc Barden and Jay Swain netted for Westfield, who are six points behind AAC with both teams having two league games left. Paul Steed scored for Burwash. John Walker put St Leonards Social II ahead at Eastbourne Athletic, but the hosts hit back for a 1-1 draw. The match between Hastings Athletic and Peche Hill Select wasn’t played as Athletic have been suspended for the second time this year. It was a good day for Division Three leaders Bexhill Rovers as they beat Orington 3-1 and second-placed Hollington United II lost by a Gary Thompsett goal to nil away to Battle Baptists II. Rovers are now six points clear, but Hollington have three games in hand. Luke Alais, James Jeffreys and James Kelly claimed Rovers’ goals in their penultimate league fixture of the season, while Orington responded via Adam How. Third-placed Bexhill United II were held to a 3-3 draw at home to Pebsham Sibex. Jacob Lee, Ben Packer and James Godden scored for the Pirates, but Pebsham responded with goals from Nick Gamble (2) and Danny Headech. Sedlescombe Rangers II moved two points clear of the bottom two on the back of a 2-2 at Catsfield. Paul Francis and Gary Underhill scored for Rangers. Bexhill Town on the ball against Wadhurst United. There was just one game in Division Four and Hawkhurst United II rose into the top four after beating West Hill United 6-3. Charlie Hornshaw (2), George Lawrence (2), Shane Colvin and Gregory Daniel scored the Hawkhurst goals, while Tyler Smith, Harry Hale and James Walker netted for West Hill. 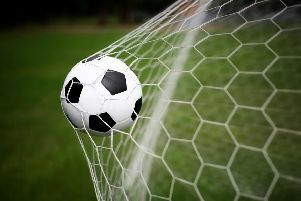 Wittersham II took another sizeable step towards the Division Five title as they won 4-0 away to third-placed Cranbrook Town and second-placed Bexhill Broncos lost 2-1 at Hampden Park. The gap between the top two is now 11 points, with Wittersham having played an extra game. Greg Stoodley (2), Jonjo Andrews and Jordan Swain were on target for Wittersham, who have now scored 101 league goals this season - far more than any other club in all six divisions. The Broncos suffered a second successive defeat in a game containing three penalties. Ed Manford scored his first goal for Sedlescombe Rangers III in their 1-1 draw against Bexhill Spartans, for whom the point was enough to climb off the foot of the table. BEXHILL Town reached the semi-finals of the Sussex Bluefin Junior Challenge Cup after edging out last season’s finalists and fellow Division One team Wadhurst United 1-0. Bexhill Town and Wadhurst United battle it out in their Sussex Bluefin Junior Challenge Cup quarter-final. A tight contest was settled by a Ross Cook goal with 10 minutes remaining. Bexhill’s reward is a trip to Romans United in the last four on Saturday March 4. The semi-final line-up in the league’s Premier Travel Challenge Cup has at last been finalised. St Leonards Social defeated fellow Premier Division side Old Hastonians 3-0, avenging a 3-1 loss in a Hastings & District FA Intermediate Cup quarter-final the previous weekend. Andy Garman claimed a brace with Brett Patton completing the scoring. Battle Baptists won 4-1 away to Eastbourne Rangers in another all-Premier Division affair. Glen Carrick struck twice, and Finlay Garlick and Harry Loates netted one apiece for Battle. Three quarter-finals were played in the Hastings & District FA Lower Divisions Cup and Icklesham Casuals II needed penalties to overcome fellow Division Five outfit Northiam 75 II after a 2-2 draw. Daniel Russell and Stewart Marshall scored for Icklesham, with Samuel Munday and Ben Stapley responding for Northiam. Icklesham will host Magham Down in the semi-finals after their 2-0 success away to Division Four rivals Mayfield II. In the other half of the draw, Division Four club Sandhurst beat Battle Baptists III, from Division Five, 2-0 with goals from Andrew Turner and Gavin Hickmott. Division One leaders Rye Town are through to the semi-finals of the Robertsbridge Charity Intermediate Cup after easing past Westfield II 6-0. Richard ‘Alfie’ Weller bagged a brace, and there was one apiece for Ben Heffernan, Dominic Cruttenden, Charlie Stevens and Sammy Foulkes.